NO To NEW TRIDENT - For LOVE & For LIFE: Eric Shclosser: Time for "honest appraisal of the risks and benefits of...Trident"
Eric Shclosser: Time for "honest appraisal of the risks and benefits of...Trident"
Journalist Eric Schlosser broke new ground with his 2013 book Command and Control: Nuclear Weapons, the Damascus Accident, and the Illusion of Safety. Through his careful and exhaustive research on nuclear weapons for this book Schlosser has become a respected voice regarding nuclear weapons safety and policy. 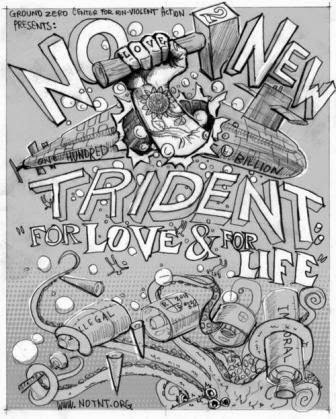 In the article below in The Herald Scotland, Schlosser says (among other things) that "There should be an honest appraisal of the risks and benefits of having Trident..." Although Schlosser was speaking to a Sottish audience, he was obviously speaking to the subject of Trident on both sides of the Atlantic. Both are relics of the Cold War, and supporters justify their continued existence (and the building of replacement fleets) using Cold War rationale. We can only hope that Schlosser will continue to travel and speak on the topic, bringing it to the forefront of public discourse on both sides of The Pond so that we can have an open and honest dialogue about why we need to continue spending trillions of dollars on weapons that we can never use and that present such huge risks to humanity. Note: Text in the article highlighted in BOLD is my emphasis. On the morning of September 19 this year Scotland woke to find that, among other things, it was still a nuclear state. 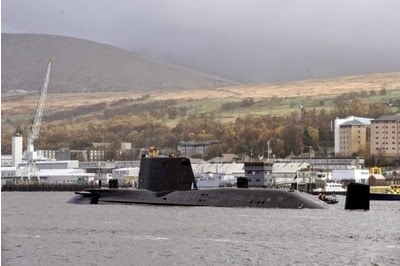 The choice to stay within the United Kingdom meant that Faslane remains home to Britain's nuclear deterrent for the foreseeable future. But with the Trident missile programme up for renewal in 2016 the investigative journalist Eric Schlosser believes it should remain a live issue. "I have to say whether you support them or you oppose them, nuclear weapons should be an issue of great concern and interest in Scotland and I hope there's a very vigorous debate about them because they're in your backyard," Schlosser told Herald Scotland. Anyone who has read Schlosser's latest book, Command and Control; The Story of Nuclear Weapons and the Illusion of Safety, can understand why. Schlosser who made his name with Fast Food Nation, his expose of the fast food industry in the United States, has spent the last six years looking at the record of nuclear weapons in the United States since their invention until the present day. Between 1950 and 1968 alone he discovered at least 1,200 nuclear weapons were involved in significant accidents. A single safety switch prevented the detonation of a hydrogen bomb in Faro, North Carolina, in 1961. And that record of accidents continues to the present day. "There's this mentality that because it hasn't happened it can't happen and that's just a fallacy," Schlossser says. "You could say because of the laws of probability it is more likely to happen now than ever before." Schlosser, who is based in New York, is travelling to Vienna this week to talk at an international conference on nuclear weapons. Speaking from his home he said that the message he intends to give is that nuclear weapons are complex, dangerous machines, "and, like all machines, they go wrong". "It seems that human beings are much better at creating these systems than controlling them, understanding them or knowing what to do when they go wrong." The American military is currently struggling with aging nuclear weapons and poor morale among those looking after them. Last week Defense Secretary Chuck Hagel, who has now stepped down, announced that The Pentagon will have to spend $10bn to make emergency fixes to its nuclear weapons infrastructure which is also suffering from broken and missing equipment, poor leadership and inadequate training and staffing. "There's been incredible complacency in the management of nuclear weapons," Schlosser argues. "They're just not glamorous for the military any more. There's an acknowledgment within the United States military that they pretty much have no use except for deterring an attack on the United States. The military doctrine of the United States right now is whenever possible, as much as possible, to minimise civilian casualties and nuclear weapons are the exact opposite of that." And America, he points out, has more experience than most in dealing with nuclear weapons. As such it represents best practice. "And yet still we've come close again and again and again. That tells you something about the challenge of managing it." With India and Pakistan increasing their nuclear capabilities and fears that Iran could develop nuclear weapons through its nuclear power programme we should be worried. Schlosser is not convinced that a deal in the talks with Iran - which have just been extended after failing to meet the deadline - can ever be reached, especially with a very conservative US Congress now in place. But if Iran does progress to join the nuclear club that raises issues beyond the inevitable escalation of tensions in the Middle East, he points out. "Being a new nuclear weapons state means not having very much experience of this technology meaning a much greater risk of a catastrophic accident." That doesn't describe Scotland, of course, but Schlosser believes Trident itself is problematic. 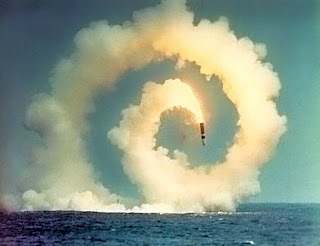 "It was built for a very specific purpose during the cold war and certain choices that were made make it potentially more dangerous as a weapons system; specifically the type of rocket fuel used in the third stage of the missile and the type of conventional explosive used in its warhead. If you have a fire and an explosion you can have a fair amount of plutonium scattered and you might even have a nuclear yield at some level. "There should be an honest appraisal of the risks and benefits of having Trident and not just a boilerplate denial that these things are perfectly safe, because they're not. "If you were going to make the Trident missile today you would not design it the way that it is and it would be a safer weapons system so you could argue one or two things. Get rid of them or load them very carefully and unload them very carefully and protect them from any terrorist activity very carefully." Schlosser's book Command and Control: Nuclear Weapons, the Damascus Accident, and the Illusion of Safety, published by Penguin Books, is available at public libraries and booksellers everywhere.